Don’t hold your breath waiting for an official retraction. But after the past few days’ events, arguments made by Hedgeye and Barron’s against oil and gas producer master limited partnerships are effectively in tatters. Linn Energy’s (NSDQ: LINE) higher bid for Berry Oil (NYSE: BRY) signals that merger is back from the dead, with a projected mid-December close. And the Securities and Exchange Commission has stated it has no further comment on the Form S-4 filed in support. Linn did report at the outset of its third quarter conference call that the SEC staff is still requesting documents and communications, relating to hedging and financial measures not officially sanctioned by Generally Accepted Accounting Principles (GAAP). But odds of an SEC action that comes close to dividend-threatening magnitude now appear remote. The bull/bear war is keeping Linn’s unit price volatile. But there’s clearly an ongoing short seller retreat from other oil and gas MLP names, even as oil and gas prices have backed off in early November. Sector short sellers are getting a break now, as oil and gas prices back off and take energy producers down with them. The opportunity to bet against MLP dividends on the so-called Linn effect, however, has clearly passed. And should energy prices start heading higher, odds of a series of short squeezes will rise accordingly. Short sellers borrow stock to sell it, and buy back to close trades. They make money when a stock gives up ground. They lose when a stock rallies. And they get squeezed and hit with huge losses when a stock rallies quickly, forcing them to buy back at any price, which in turn pushes the stock higher still. Two ways to measure the level of short selling of a particular stock are (1) short interest as a percentage of a stock’s total float, and (2) days to cover, which is essentially total short interest divided by average daily trading volume. The higher these numbers, the more bets there are against a particular stock—and the greater potential for a violent short squeeze if the crowd is wrong. That’s not to say short sellers aren’t often right. Those who went short on Linn early and weren’t too greedy or bedazzled to not take a profit did reap a tidy sum. Later followers of Hedgeye’s advice on Linn, however, have had their heads handed to them. Just as trend following buyers lose by buying too high, so do less savvy shorts establish positions after the money has been made—and risk of a squeeze is highest. Investors tend to give the bear case more weight than bullish arguments. But just as not every buyer is Warren Buffett, not every short seller is another Jim Chanos. There’s smart and dumb money on both sides. And the risk of being on the wrong side with a short position is never higher than when the bear case becomes conventional wisdom. So where has short selling become conventional? Since late April, bets against dividend paying stocks have risen across a range of sectors. The past several months, the consensus has been the Federal Reserve is on the verge of “tapering” off easy money policies it’s followed since the 2007-09 financial crisis. And the bet is resulting rising interest rates will crater prices of dividend paying stocks, rewarding short sellers. This argument has two huge flaws. First, the Fed hasn’t cooperated. In fact, despite all the blather about tapering filling up the airwaves this year, the central bank has consistently stated it won’t ease up on easy money until the US and global economy can take it. And it’s backed up its words fully with deeds. More important, dividend-paying stocks are not bond substitutes. In fact, since the 2008 crash, they’ve rallied when the economy has picked up steam, and interest rates have risen. And they’ve fallen—sometimes sharply as in late 2008—when growth has faltered and benchmark interest rates have dropped. 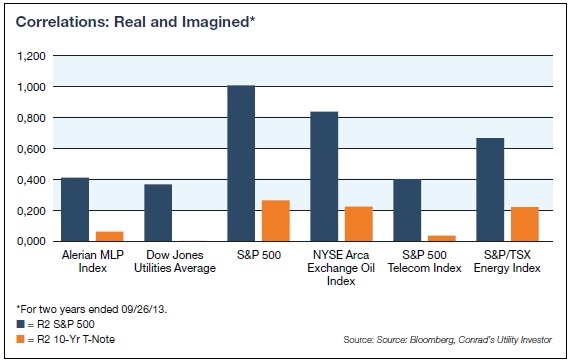 Those are simple facts that can be easily verified with a glance at a five-year price graph of any of the indexes represented in my table “Correlations: Real and Imagined.” And the table itself sticks an even larger fork into the taper trade. The statistical measure “R2” basically shows how closely data match up. In this case, I’ve compared indices of five dividend paying stock sectors—MLPs, utilities, super oils, telecom services providers and high yield Canadian energy—with two benchmark indices: The S&P 500 for stocks and the TNX, the yield on the 10-year US Treasury note. Data are for the two years ended October 31, 2013. The higher the R2, the closer the data correlate. The S&P 500’s R2 to itself, for example, is 1-to-1, a perfect match. Ironically, the S&P 500 has a much closer data match to the 10-year’s yield—the benchmark for interest rates in general—than any of the dividend paying stock indexes. And all of these indexes have a far closer match to the S&P 500 than to benchmark interest rates. Interest rates can have a real impact on profitability and therefore dividend safety, particularly for heavily leveraged companies. But rates’ ability to influence returns is purely on the bottom line. Dividend paying stocks’ prices are no more “interest rate sensitive” than other stocks—in fact the table shows they’ve been much less so than the stock market benchmark, the S&P 500. That hasn’t stopped investors from trying to cash on the Taper Trade. And the result is a wealth of potential short squeezes in the making in dividend paying stock sectors. The opportunity is two-fold. For long-term investors, it’s the best possible time to buy and lock away good companies at low prices. For traders, it’s time to stalk the shorts in search of a potential squeeze, and big time gains. When new short positions are entered against a stock, it has the same impact as an ordinary sale, meaning it pushes a stock lower. A large volume of short interest against a stock also has the tendency to increase investors’ fear level, which further depresses prices. The upshot is heavily shorted dividend paying stocks are cheap. As is the case with very high yielding stocks, there’s always a reason. Mainly, the underlying company faces a well-known challenge that every buyer and holder should be aware of. But the bar of expectations for success is also very low. And if the company can hurdle it, its share price will rise—and squeeze the shorts. If a high yielding stock is heavily shorted just because of heavy bets that interest rates will rise or energy prices fall, there may be little or no real danger to the dividend. And buyers’ only real risk will be how long they have to wait for investor sentiment to improve. These are the ideal targets for long-term investors seeking to add to holdings. However, if a high yield stock is shorted because of business weakness, its valuation is likely to be far lower. Upside is that much greater, but only if the company can overcome challenges to its health. Buying this type of heavily shorted stock means taking a calculated risk. And the only time it makes sense to jump is when you have adequate knowledge of the individual company and industry in question. But they’re also the best places to look for short stalking opportunities. One sector that’s still ripe for potential short squeezes is high yielding oil and gas producers. 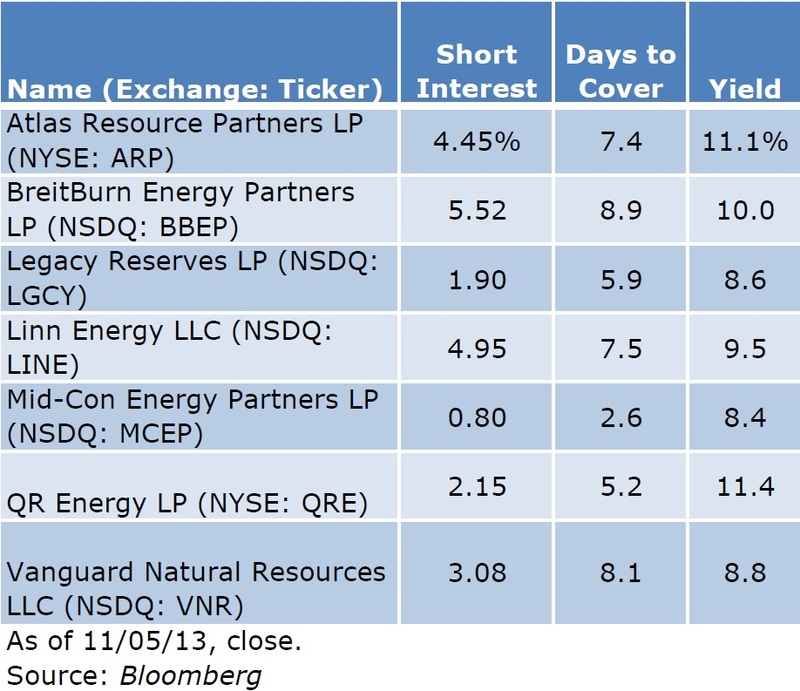 Over the past several weeks, my co-editor Elliott Gue and I have been highlighting good candidates in our Energy & Income Advisor, including MLPs and Canadian companies. In addition to worries about MLP producer accounting being dismissed, we’re also seeing strong operating results that have topped expectations, not only of other Wall Street analysts but also of management.